On the Opika Pende set, I included what I think is an excellent example of praise singing from Western Kenya featuring the nyatiti. This important instrument of the Luo people is an 8-stringed lyre that’s plucked like a lute, using quick repetitive phrases. The resonator is sometimes held against the player’s chest, sometimes not, but generally the player has small metallic rings attached to his foot, which are tapped against the body of the nyatiti. The short melodic phases (known as puch) and hard tapping make for a pulsing, driving musical experience, accompanied by loud and intense praise poetry. It’s a music for all significant occasions in Luo culture, and traditionally the musicians were itinerant. To hear a sample of the Opika Pende song on iTunes, click here. For a dynamic video of a present-day Luo praise poet, click here. Today’s track is a musical development – an attempt to bring the nyatiti into the electric age via electric guitars (a lead, and a bass). It must have seemed a natural switch, to attempt to transform and update Luo praise singing with a non-traditional instrument. This certainly has happened all across Africa (and elsewhere), with often really interesting results. Sure, in some cases if a modern or more western instrument took hold, it transformed the older musical type into something that would often soon cease to exist. Varying opinions exist on that, but I am not a purist. Yet, in any case, I’m not sure if this switch to electric guitar ever really took hold – this is the only example I’ve come across. Even if it’s more common than I know, it’s something different to my ears and hopefully yours. While many link the sound of “benga” music back to the nyatiti, this is more of a precise interpretation of nyatiti praise music, just on electric instruments. It’s pretty killer. The Mambo label was one of the first labels run by the important music entrepreneur and producer Arvindkumar P. Chandaran, who based his company and music store in town of Kericho, west of the Great Rift Valley. Chandaran’s name dots many East African 45 rpm labels (Hundhwe, Saba Saba, Stranger, Pwani, and Wachezaji, just to name a few), and as a producer he apparently was a driving force in popularizing benga, both with his slew of labels and his well-known Chandaran music store. 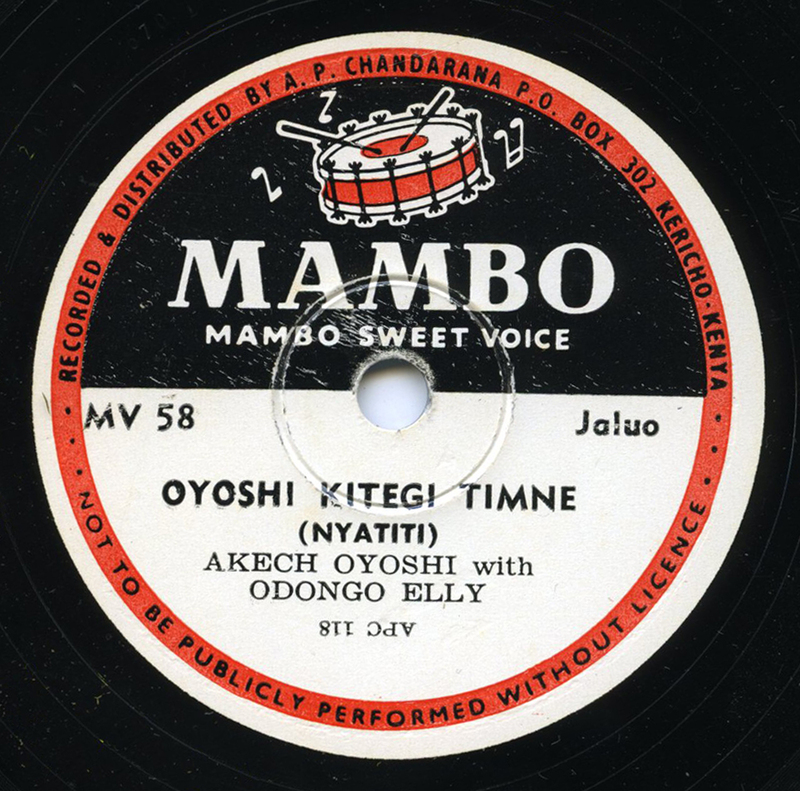 While the 45 era in East Africa was staggering in terms of volume (as evidenced by the excellent Kentanza Vinyl site), the 78-era in East Africa was also incredible – dozens of small, privately owned labels were competing and releasing discs in varying amounts (often small amounts I bet). Most all are very difficult to find on 78 (though 45s were also issued by many of these labels): Mzuri, Rafiki, Robina, Tom Tom, Tejura, Festival, Twist, Equator Sound, Africa, Kenyans, African Voice, AGS, Nyota, CMS, Jogoo, Jambo…it goes on. I would say this 78 was recorded and pressed sometime during the early to mid-1960s. Beautiful – exciting music, great label, and fascinating background. I’ve loved that nyatiti sound for many years, but never heard an electric guitar version of it. Many thanks. Wonderful! Thank you! I’ve had the good fortune to spend two weeks in Kenya and searched for music such as this but sadly didn’t find much.